Coral Environmental have been a client of ours for sometime now and recently have decided to update their entire branding with a brand new website as well as some great new graphic design to illustrate the types of services that they offer. Our Graphic Design team worked on some excellent layouts and styles to be implemented across the entire brand including web, print and downloadable printable material. 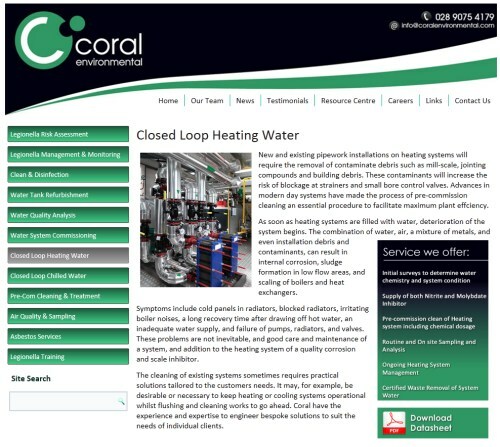 A series of datasheets were produced to provide information to property owners and facility managers about the range of products and services offered by Coral Environmental. The website was redesigned to include many new pages encompassing all the different services that the company offer as well as team information, customer testimonials, a resource centre and news page, all elements of the website can be updated and edited in-house, though the company can rest assured that Ardnet will always be there to help with any content updates as well.